Cure Blog: "JAPAN COSPLAYER OF THE YEAR 2010" Internet voting is being accepted now ! 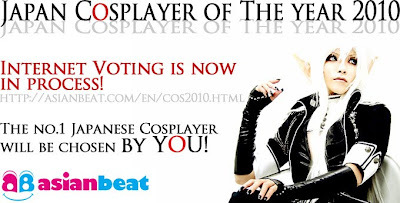 "JAPAN COSPLAYER OF THE YEAR 2010" Internet voting is being accepted now ! From the Japanese cosplayers nominated by overseas fans, No.1 cosplayer will be chosen by you. The winner will attend the Comic Party in Bangkok etc. We look forward to your participation now ! !